Build Like A Boss: I am Fire, I am Death. I am Fire, I am Death. Happy new year everyone! The rest of the blogging team are still away, and I'm about to head off again in a day, but I couldn't resist blogging these. 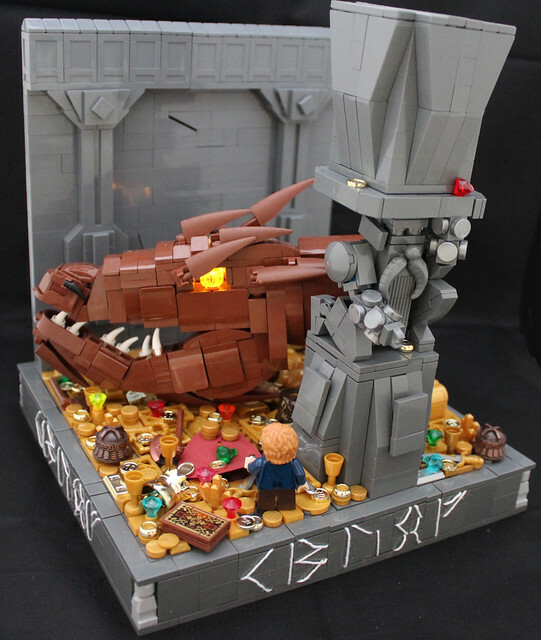 Round 2 of the annual Middle Earth Lego Olympics is well under-way, and there are two entries that really caught my eye. This features some awesome NPU on the beard, some great character building, and that base just tops it off, perfect cobblestone effect! The base is very well done, the use of string to create dwarven runes is great, the NPU (once again on the dwarves beard) is brilliant, as is the shaping of smaugs head, and the lighting in the eyes makes it pop! Lots of boss going on here!